You may have the best content marketing team in the business but you can still learn from your competitors. In this detailed case study we examine how to track and evaluate your competitor’s content performance. In this example we have focused on Trackmaven, not really a core competitor to BuzzSumo but we like the team there, so hopefully they won’t mind being used as an example. The aim of our competitive review is to gain content intelligence and insights. We want to understand what is working for them and what we can apply to our own content marketing. We will also set alerts so we are notified of all new content they publish, when articles mention them and when articles link to their site. Below are 5 steps which will give us the core information we need. We will start by setting up alerts to track our competitor’s content and which will keep us fully informed about their content marketing. We will use three of the four content alert types in BuzzSumo. This uses the keyword alert except we will use Trackmaven as our keyword. This will alert us whenever their brand is mentioned in any content such as an article or blog on the web. If your competitor’s brand name is not unique you can use advanced operators eg + or – to narrow your alerts. As a competitor alert we will want to leave the minimum number of shares at zero so we see everything. If we do get a lot of alerts we can set a minimum share level to filter the alerts. 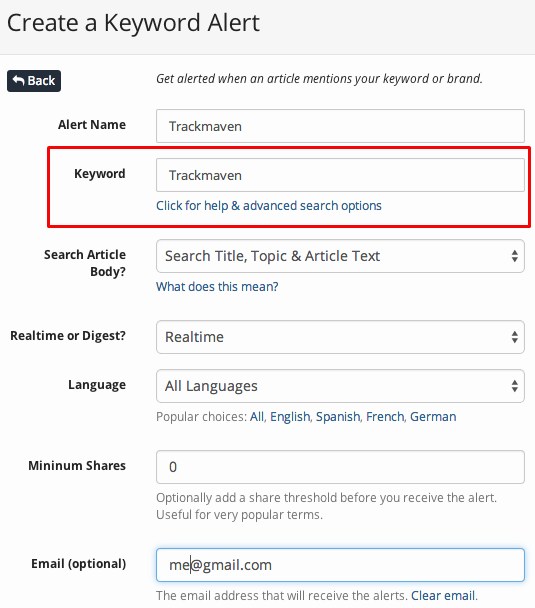 Using a domain alert we can create an alert to be notified every time new content is published on trackmaven.com. This saves us having to visit and review their site for new content. 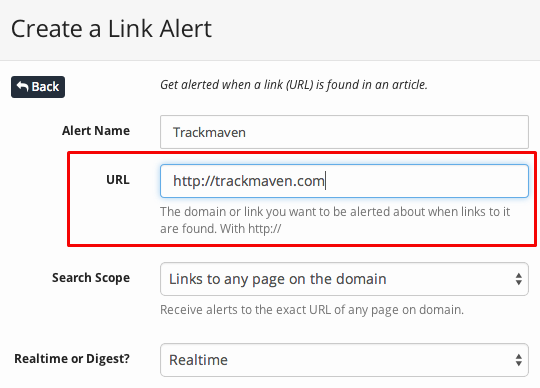 Using a link alert we can set up an alert which will notify us every time a site publishes a link to Trackmaven.com. This will allow us to review each link to Trackmaven and look at why. This may create link building opportunities. You can choose to be alerted when someone links to an exact domain or any page on the domain. For competitor tracking I suggest you track links to any page on the domain. All alerts will be emailed to you but you can also review them on the Content Alerts Dashboard as shown below. 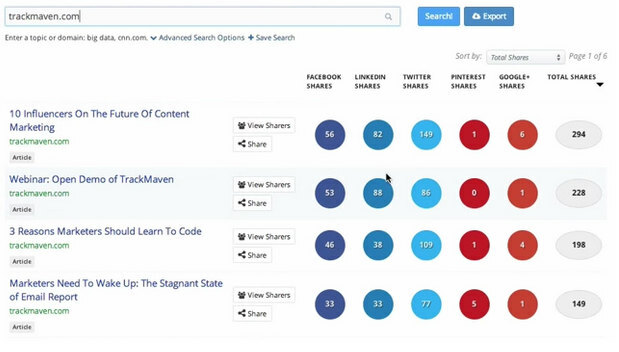 Having set up our competitor content alerts we can now undertake a BuzzSumo content analysis report for Trackmaven’s domain namely Trackmaven.com. This returns the following data. Thus we can see that over the last 6 months they published 100 articles which received an average of 54 shares each. We can see that most shares were from Twitter, followed by LinkedIn. In terms of content types, their most successful posts were list posts. The analysis report also provides us with other data on their content such as content length, day published etc. How Trackmaven is doing is one thing – but we want to know how we’re doing compared to them, right? So the next step is to compare their content performance to our own. We can do this by running a domain comparison report which gives us the data below. 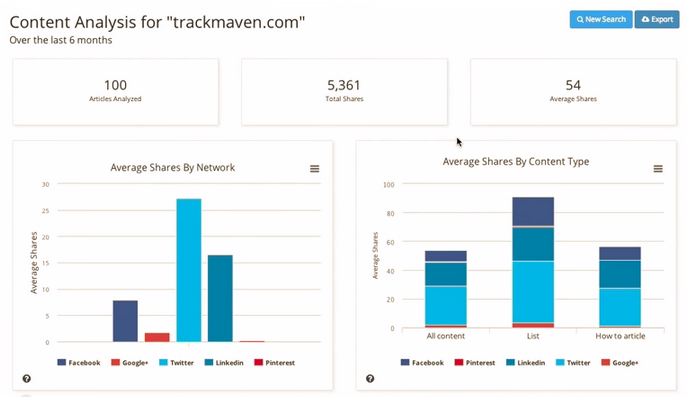 The report continues to show us the Trackmaven data but now it compares it to BuzzSumo. Thus we can see that at BuzzSumo we only average an article once every two weeks, whereas Trackmaven publish two articles each week. Thus they publish four times as many articles and in the last six months they received almost twice as many total shares. However, BuzzSumo articles received a much higher level of shares per post. 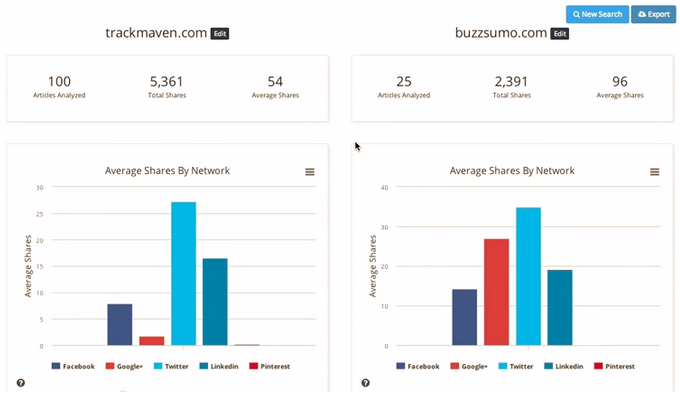 When we look at the shares by network we can see that Trackmaven use Google Plus very little in comparison to BuzzSumo, and that this accounts for most of the extra shares per post. The chart below shows that Trackmaven publish content fairly consistently across the working week whereas at BuzzSumo we publish content early in the week as we believe that does lead to higher levels of average shares. The big difference in content between Trackmaven and BuzzSumo structurally is content length. The long form content, above 3,000 words, on BuzzSumo receives more shares on average. We can see there is a direct correlation between content length and the degree of sharing. This would suggest we should continue with long form posts. So a few actionable insights emerging from the side by side comparision: Long form content, published earlier in the week, and usingGoogle Plus, is getting better shares per article for Buzzsumo. The stats take us so far. But, jealous little Sumos that we are, we want to see what the killer content was for Trackmaven, so we can get some of the action. So the next stage is to move away from the overview numbers and look at the actual content being produced by Trackmaven and see how well it is performing. 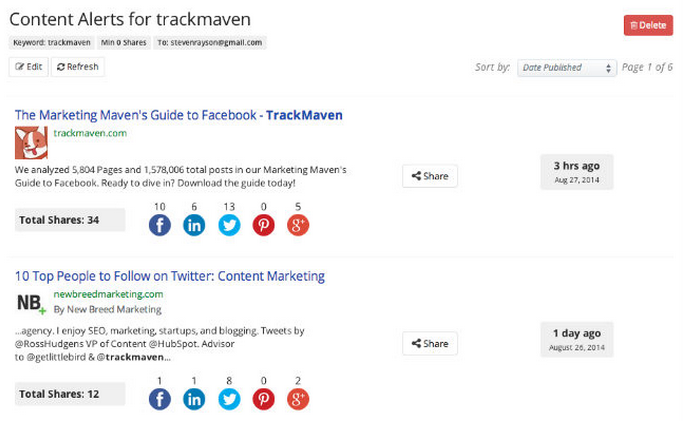 By searching for Trackmaven’s domain on BuzzSumo we can see their most shared content. Using BuzzSumo Pro we can look back over the last year or a more recent period. This report allows us to review the headlines they are using and the networks they get shared. We can also look at each content item in depth. Who are fans of Trackmaven’s content? Could they be fans of our content? For each article we can click ‘view sharers’ to see who shared Trachmaven’s content. This gives us a report such as the one below. 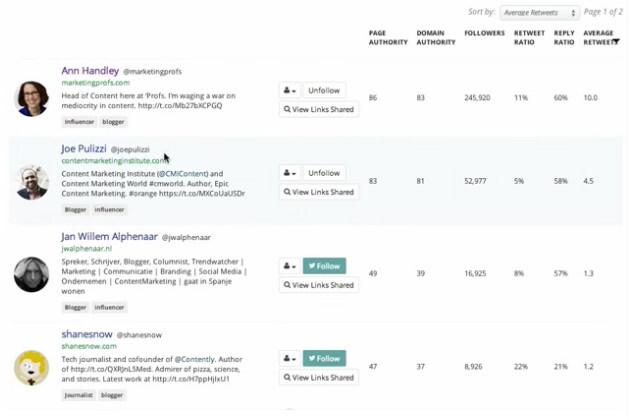 BuzzSumo will show us overview information such as the number of followers they have, their domain authority, reply ration and average numbers of retweets. BuzzSumo will also show you whether you already follow the sharer on Twitter and give you the option to follow them and add them to a Twitter list. You might want to set up a Twitter list of people that share competitor content. In the case above you can see I already follow Ann and Joe but not Jan or Shane, thus I can review them and whether I want to follow them and to start building a relationship with them. In order to build a relationship it is a good starting point to understand the influencer and identify the type of content they share. Using BuzzSumo you can view the links they have shared in the list form below and also in chart form by domain shared. Following these five steps will give you a very good overview of the content marketing undertaken by your competitor, how well it is resonating and who is amplifying their content.